What the Consumer Edition really gets right is the price. If you're one of the many who already owns the necessary Samsung phone then for £80 the experience of playing through Land's End makes it worth buying one alone. Sure, some other content falls firmly into the "novelty" category, plus not all experiences are enthralling by any means. But for the handful of the ones that are, the Gear VR makes it mark. Virtual reality, often known as VR, has a long and winding history. From the distant dream of Sega's VR, unveiled back in 1993, to the modern day it's-almost-here reality of Oculus Rift, HTC Vive and PlayStation VR, it's South Korean giant Samsung that's here to take on the more entry-level market with its Gear VR. Virtual reality is still something of a dreamers' concept; the idea of being transported from this world into a virtual other has been topic of sci-fi and social science for many years. But unlike the Holodeck in Star Trek, the only way to attempt that in the here and now is to strap a helmet to your face. Or, in the case of the latest Gear VR Consumer Edition, effectively strap a Samsung Galaxy S6/S7 (or edge/edge+ variant) smartphone to your face, via a helmet accessory (the previous Innovator model was designed for the Note 4 only). Which sees us arrive from our excitable childhood dreams of actually being Sonic The Hedgehog, to a somewhat more realistic standpoint of where VR is at. It's brilliant yet botched all in the same breath; expectations of being transported from one world to another will be met by delight by some, but nausea and discontent by others. Make no mistake, VR is going to split the crowd - even in the Oculus-powered setup that the Gear VR embraces. But VR is also a whole lot of fun when the content is right. When we first saw the Gear VR in 2014 it lacked the necessary titles to drive it forward. And while the Gear VR Consumer Edition is still limited in its breadth of titles, it's a vast improvement thanks to the likes of Land's End and others. It's also cheaper at £80 and, therefore, the more accessible stepping-stone on the path to Oculus proper. First thing's first: to use the Gear VR you'll need to have a Galaxy S7, S7 edge, S6, S6 edge or edge+ to hand (or a Note 5, which isn't available in the UK). Which, at around £600 and up, isn't a budget entry point. If you're already using such a device then of course the Consumer Edition's £80 price point makes it a bit of a bargain. And it's definitely better looking and more fully-featured than something like Google Cardboard (the literally cardboard viewer designed for a variety of phones). You might wonder why the Gear VR is matched to Samsung's most premium phones. The answer is fairly simple: they've got the highest available resolutions the manufacturer offers, to give a better visual experience, and are matched with powerful processors to maintain high frame-rates and graphical fidelity. A lesser phone just wouldn't cut it. What's perhaps most interesting about Gear VR is that it doesn't depend on tethered wires to a computer (the only wire you might need to worry about is a 3.5mm headphones cable, but that's no worry if you're using Bluetooth instead). Oculus, Vive and PS VR all depend on a tether, which can inhibit the experience - despite those three all offering superior power to Samsung's offering. As the Consumer Edition of the Gear VR headset is cheaper than the earlier models you'll miss out on a few things, but not all of it is a negative. In this latest guise the bulky padded sections to the headstraps are gone - which we think is a positive, as without the top section the headset is easier to put on and, for us, actually more comfortable. There's also a white interior and a lot more space for glasses wearers to fit everything in - even if you're donning your latest trendy Shoreditch oversize lenses. We didn't find light leak an issue either, but the lack of a cooling fan (as per the Innovator Edition) does mean some fogging may occur (but there's less battery draw from device, so another positive). Our tests have more seen the brow sweats and some condensation accumulation on the interior of the lenses more than anything - but that happened in the older edition anyway. 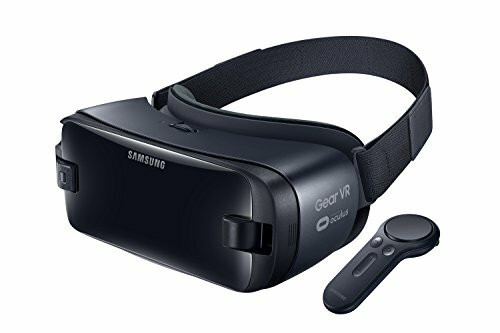 The Gear VR is easy to operate with look-to-operate functionality alongside physical controls comprising a swipe-controlled touchpad, back button and volume up/down controls all to the right hand side of the device. In the Consumer Edition this touchpad is no longer flat and smooth like the previous models - helping to find the indented central position, which is trickier than it sounds when you can't see your own reality. Samsung Gear VR review: Sensational or sickening? If you've used Oculus Rift then you'll have a rough idea how the Gear VR feels. It's an undoubtedly impressive, immersive, hold-onto-your-hat experience, giving you the freedom to look all around a responsive, low latency 360-degree virtual world - whatever that happens to be, whether a game or visual experience. It's not the walk-around experience of HTC Vive, the only system to go all-in with full body interaction. Some people will get on fine with the Gear VR experience, while others will feel claustrophobic and/or nauseated - just like with Oculus Rift - in a hold-onto-your-stomach kind of way. But that's all relative to personal experience - some people will feel absolutely fine and dandy with the Gear VR on. In part it's going to depend on the type of experience you're going through, whether that involves physical movement through a virtual world or a static viewpoint, while more complex patterns and shapes moving at pace are said to disorientate more than simpler ones, as an example. Using the Galaxy S6 for this test, with its 2560 x 1440 resolution screen (the newer S7 is the very same resolution), you'd think the detail when using the Gear VR would be second to none. But it's not as cut-and-dry, as the built-in lenses significantly magnify the area of view (which isn't the full amount of the screen in any single field of vision) to make for a wrap-around 360-degree view. This magnification causes what's known as "screen door effect" - where you can see the dividing lines between pixels. It's not painfully apparent, as the stop-gap between AMOLED pixels is slight, but it's certainly present and might be a more pixilated experience than you're expecting. To counter this effect a softer focus can help, something we feel Samsung is using here because sharpness isn't quite perfect - in part the product of convex lenses distorting things, especially towards the outer edges (which can produce this distracting "bleed" effect too). Focus can be tweaked using dioptre adjustment via a wheel atop the device should you be slightly long/short-sighted and not wish to wear your glasses during use, but thanks to the new design we felt ok with glasses on. Frame-rates, too, have their limitations. As phones use a 60Hz panel you're fixed to that refresh rate as a maximum. And while 60fps sounds like plenty enough, again, the experience is different from a TV screen and so ghosting of moving subjects in view is often apparent - more so as they travel faster. Full Oculus Rift operates at 90Hz. All that said the Gear VR experience is competitive, especially at this entry-level of the market. Virtual reality as a whole has a fair way to go before 4K resolutions per eye and super-high frame-rates are possible/sustainable in the latest games, but we're already out of the starting blocks heading at pace. At this phone-powered level there's nothing better than Samsung's offering. A key driver for any virtual reality setup is what's available to play, see and do. As the Samsung system utilises adapted Oculus VR on an Android operating system, that paints a potentially strong picture for the future, as lots of people have access to Android devices. The first time you fire-up the system there's a walkthrough, which serves well to educate. Upon each load - and a proximity sensor knows when the Gear VR is positioned to the face - you'll be presented with a home screen, comprising Store (Oculus and Samsung) and Library options. Amid the latest downloads, there are also shortcuts to Oculus Cinema and Oculus 360 Videos/Photos. It's easy to grasp what's what, and it's not all just gaming. As stated on the Samsung website, there's no controller included and "some high-quality gaming apps may require the use of an Android game controller", which is something not to overlook. If you want to play games and even use some of the Oculus software for experiences then you'll need a decent controller paired via Bluetooth. At launch the Gear VR had just a handful of games and nothing that really gripped us. But that's all changed thanks to some solid titles that really show progress. Below are a bunch of the more prolific examples. For us this is the game-changing title for the Gear VR. A beautiful gameworld, reminiscent of Momument Valley (ustwo games produced both titles), the floaty, ethereal experience of Land's End is truly captivating. Simple controls and puzzles lead the game mechanic, where you match dot sequences on screen before flying through the gameworld to progress. It's never entirely clear who/what you are, nor why such puzzles exist - but that almost assists in setting the tone and keeping the mood of this game. If it wasn't in VR we don't think Land's End would have the same impact. It stripped back graphical qualities and ideas show off just how well VR can be utilised. Although some will find the static position matched with in-game movement to be disorientating. Fan of quirky platform games? This one is for you. You'll want a controller to navigate around, using the Gear VR as a camera-like mechanic to line-up, say, grapple-hooks or target baddies. Just because the game is from Cartoon Network doesn't mean this is only one for the kids. The characters and dialogue are funny and engaging, delivering a different kind of VR experience to the usual first-person experience. Like to be scared out of your wits? No problem. Deadhalls, the first-person dungeon crawler, is here to help you soil yourself. This game really plays on light and dark, with the enshrouded 360-degree experience really making you feel like you're walking through creepy dungeons. Sound, too, is a key part in making this a genuinely scary game. We couldn't talk about VR without there being a first-person space shooter. At launch there was Anshar Wars, but Gunjack steps things up a notch in our book. There's perhaps nothing unusual about this game, but it delivers all the action you could want: shooting, shooting and more shooting. Power up, attack, defend - you'll be spinning your head around like a crazy owl to try and keep up with the on-screen action. This video-meets-game is an ingenious storytelling innovation that really shows what VR can do. Just look at the video above to get a taste of the way virtual reality freedom is employed to progress the storyline - rather than trying to keep up with a video it's been rethought to let the VR directly affect the tale. From Skybound, the studio behind of The Walking Dead game, there is a brilliantly tense and horrific feel to this title. Plus it's free, which makes it a must have. Check out how immediately mesmerising this fun and free game is. Set inside a human body, you play as a machine vessel aiming to bring your human host back to health. While the machine's attempts at humour aren't quite on a par with a game like Portal, it's still entertaining. To play you use head movements to control your speeding vessel. It's your typical racer with speed-ups, dangers to dodge, and items to collect. Except this is on a totally cylindrical track, like speeding along the outside of a pipe. Plus it has an impressive moving backdrop that may distract you to the point of crashing into dangers. Ok, so these aren't games. And we're cheating a bit because this is two services. Oculus Video is a virtual cinema experience. You can watch trailers, movies, and even your own capture. But it all takes place in a virtual cinema, which we don't really understand - because you could go to an actual cinema or, you know, watch one on TV. It might make more sense if the virtual environment was, say, the surface of an alien planet rather than a mock-up of a cinema, to really pull on VR's strengths. But no, it's just a virtual cinema. Samsung Milk VR is a bit like the 360-degree "YouTube" for Gear VR. But, sadly, it's not available in the UK (only US), so customers in Blighty won't have access to the service just yet. There's potential for this service to blow-up in popularity with the increase in 360-degree recording devices, though, so watch this space. With the original and Innovator Edition Gear VR models it was Note 4 or the door. With the Consumer Edition there's a broader acceptance of handsets (SGS7, SGS7 edge, SGS6, SGS6 edge, SGS6 edge+, Note 5) with a size-adjustable fit that, assuming Samsung doesn't suddenly inflate the size of its next-gen phones by a marked amount, means even future phones will remain compatible. That's one of our initial worries with the earlier model hopefully knocked on the head. But that doesn't mean the Gear VR isn't without its share of challenges. It's locked to Samsung smartphones rather than the wider Android ecosystem (there are pros and cons to that), the phone hardware isn't as powerful as a dedicated computer system and so there are frame-rate limitations related to refresh rate. Plus VR just won't suit all tastes. When it comes to content it's also a waiting game for that next big title or experience. Not all of which we feel are better in a VR environment. Do we really want to be watching immersive, limited resolution movie/theatre experiences? It feels like the next wave of 3D: a nice idea, but something that's never been pulled off with true success, not without being a hindrance to some degree. The first time we slipped the Gear VR on and looked around a whole virtual world, head turning to take in what was to the side and behind, part of us was impressed with the sheer spectacle. It's quite amazing. But the Gear VR, like virtual reality as a whole, won't be for everyone. In this guise you'll need a top-end Samsung phone for starters, while some users might feel nauseous during use (as you may in any VR experience), nor will you get the higher frame-rates of the pricier top-end devices, such as Oculus Rift proper. But that's to perhaps miss the point: the Gear VR is a stepping-stone to Oculus; it's a here-and-now experience to show off virtual reality's potential and to get people interested. And what the Consumer Edition really gets right is the price. If you're one of the many who already owns the necessary Samsung phone then for £80 the experience of playing through Land's End makes it worth buying one alone. Sure, some other content falls firmly into the "novelty" category, plus not all experiences - we just don't get the need for a VR movie theatre experience, for example - are enthralling by any means. But for the handful of the ones that are, the Gear VR makes its mark.